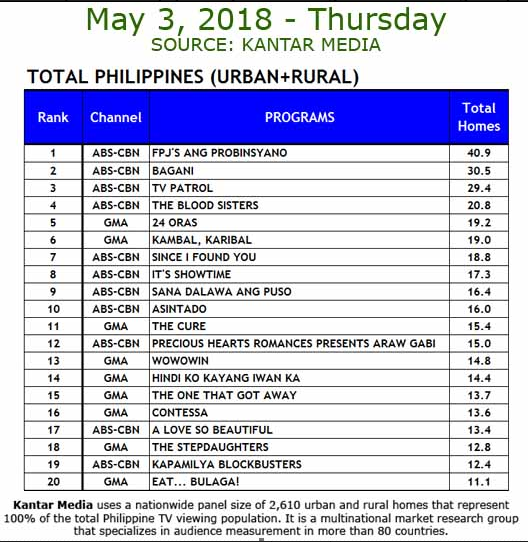 FPJ’s Ang Probinsyano remains on top on the start of May after securing more than 40% of ratings in its timeslot versus its new rival The Cure in GMA Network. In the May 2 ratings, FPJ’s Ang Probinsyano got 42.5% vs. The Cure with 14.5% and PBA 2018 Commissioner’s Cup (Live) with 2.8%. 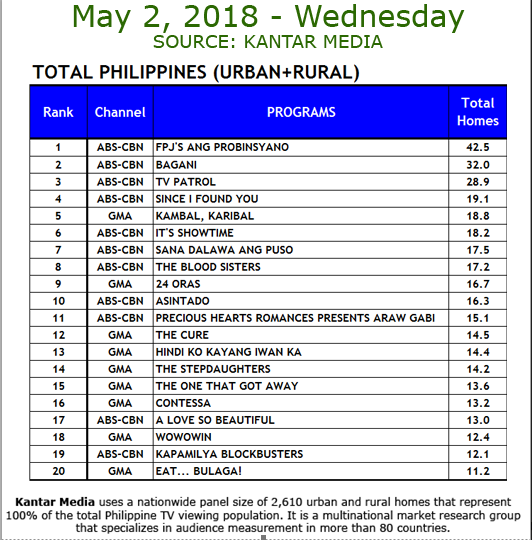 Meanwhile, in May 3, FPJ’s Ang Probinsyano earned 40.9% vs. The Cure with 15.4%. Aside from Coco Martin’s long running action teleserye that is dominating the TV ratings, ABS-CBN secures big numbers from morning to evening shows.